THE ONE WHERE Angels Incorporated take on the case of an old man accused of attempted murder, and try and stop the closure of the old people’s home where he lives. VERDICT Well we’re at the half-way point of ITV1’s legal/genre hybrid and while this episode is the best so far, it’s still far from must-watch television. With the doomsday clock ticking down you’ve got to wonder why Mr Mountjoy wants his angels faffing around with a libidinous, self-confessed poisoner and the tyrannical ex-NHS manager running an oppressive care home regime. But this week for the first time – hurrah! 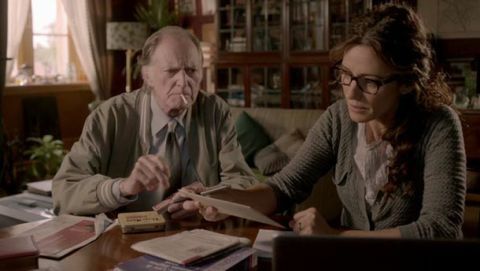 – there’s a bit more to these initially stereotypical characters, although they still don’t seem especially likable even with David Bradley ( Harry Potter ’s Mr Filch) as the pensioner in the dock. If these are examples of the humanity needing to be saved, you’ve got to wonder why the angels don’t forego the legal shenanigans and head straight to the Minster roof for beer and cigars every day. This whole case feels like an excuse for Tom to get a real feel for life on Earth – the loneliness and despair of ageing as well as the exhilaration of attraction. For the other characters it’s all about the bleak loneliness, though. Moving the emphasis from the Mills & Boon star-crossed lovers melodrama made the Zak/Hannah stuff more watchable, with Hannah’s awkward attempts to get to know her angelic ex better making her much more an object of sympathy. However, you can’t help but worry that Zak’s repeated rebuttals are just pushing her further towards the dark side in readiness for the potential fireworks of the series finale when, hopefully, some of the more meaty life-and-death stuff might finally get a look in. Meanwhile, Mrs Sheringham’s quiet kindness, the scars at the loss of her wings and the gleeful evil of Richard Pembroke remain the most interesting moments in a show that promised so much and has, so far, delivered little. Probably if you switched on ITV1 hoping for Doc Martin and saw this instead you’d find it fun enough if you could get over the supernatural element of it but, as genre fans, knowing this is from the creators of Life On Mars and Ashes To Ashes it feels a real missed opportunity. Maybe in trying for something so mainstream they’ve missed the mark on two counts. FALLING ANGELS This is Tom’s Spider-Man 3 moment. He might not go as far as the emo Peter Parker haircut, but the petulant whining and terrible dancing montage brings back horrific flashbacks (although there’s a soupcon of The Dark Knight thrown in when he’s zooming about York on a motorcycle in rebellious fashion, wings akimbo). Also, apparently angels are so sexually powerful they can “blow a girl’s head off”. Probably just as well Tom found that out before he got too far into his relationship with Jude. That could have been awkward. HE’S EEEEEVIL! Richard outstares an elderly man in a deck chair blocking his car. I’m not sure if it was meant to be funny, but I laughed. DATED POP CULTURE REFERENCE OF THE WEEK There are some lovely reminders each week of how long Zak and co have been on Earth. This week Zak commenting that having Mack visit was “like having Ned Sherrin to stay” was possibly the most wonderfully dated.